Enjoy authentic Cuban specialties, such as; “Lechon Carrillo Asado” (roast pork) or the “Ropa Vieja” skirt steak sauteed in a rich “rojo” sauce, and accompanied by a new & extremely exciting “Nuevo Latino” menu featuring fresh seafood & fish done with a delicate, flavorful and colorful touch! Continue to enjoy Cuba’s best Salsa music with “Son by Three” every Wednesday & Saturday evenings, when after dinner all the tables are moved off the floor to make way for some of the best “Merengue and Salsa” dancing on the island. 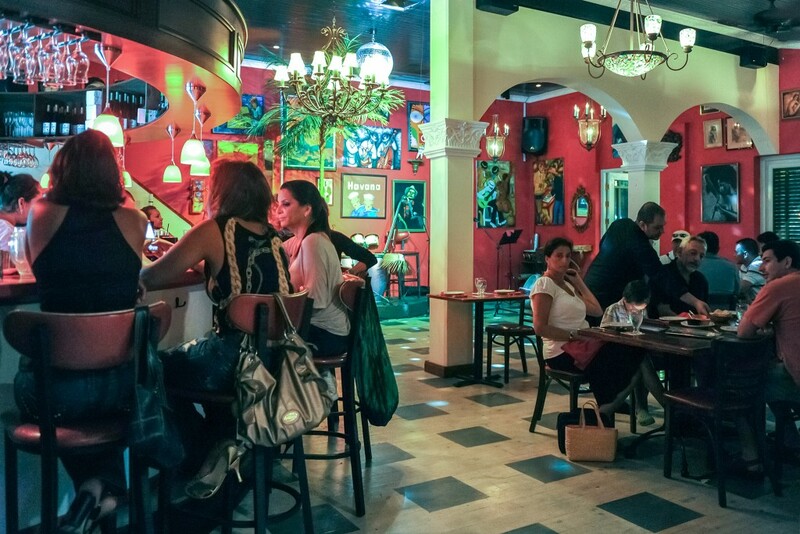 This restaurant offers great food & live music with a Latin beat. The cozy, intimate atmosphere draws everyone to the dance floor for salsa and merengue moves. Try the house mojito, a Cuban rum and mint refresher. The ambiance is imported directly out of Cuba – the real deal. This is a fun, informal, and hip eatery. Original art captures whimsical scenes of Cuban street life while up-tempo music keeps the warm staff smiling each night. Sip a mojito (a traditional Cuban cocktail), and start with the plantain chips, great with the muy picante (very hot) salsa. Your conga cocktail appetizer should arrive just in time to extinguish the fire in your mouth. Served in a half shell, the cool appetizer features lobster, crab, red onions, and carrots in a light vinaigrette. The seafood boat is a winning main course: Lightly grilled shrimp, calamari, conch, and mussels rise from a flavorful ragout of green and red peppers, onions, garlic, tomatoes, and cucumbers. Other Cuban specialties include ropa vieja (shredded skirt steak sautéed in tomatoes, onions, and green peppers) and picadillo de res (ground beef with raisins and olives). For dessert, try tres leches (three-milk) pound cake then light up a Cuban cigar with your café con leche. In the mood for something different… The charm of old Havana can be found here in Aruba at Cuba’s Cookin’, where the sights, smells and sounds of a rich Caribbean culture are waiting to be experienced. Try our “Lechon Carrillo Asado” (roast pork) or the “Ropa Vieja” skirt steak sautéed in a rich “rojo” sauce, and accompanied by a new & extremely exciting “Nuevo Latino” menu featuring fresh seafood & fish done with a delicate, flavorful and colorful touch! 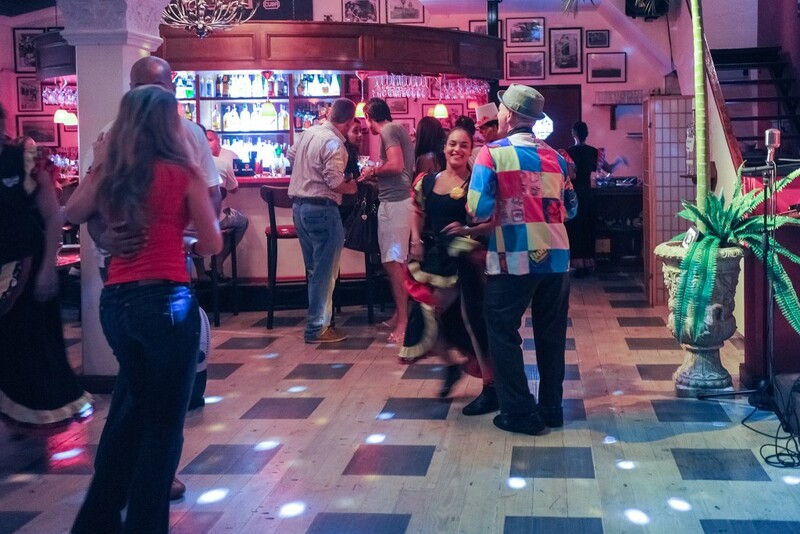 Nightly entertainment, great authentic Cuban food, and a lively crowd are the draws here. The empanadas are excellent, as is the chicken stuffed with plantains. Don’t leave without trying the roast pork, which is pretty close to perfection. The signature dish is the ropa vieja, a sautéed flank steak served with a rich sauce (the name literally translates as “old clothes”). Service can be a bit spotty at times, depending on how busy it gets. There’s often live music.